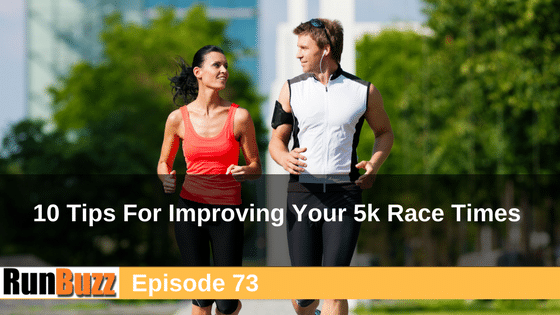 In this episode, I share 10 running tips to help you get a faster 5k race time. I recently had a listener submit a question about training to get a faster 5k race time. I responded by email, but then decided that it would make a great topic because it is a question I get frequently. If you are training for a 5k (or even a 10k), these running tips will help you improve your race times and possibly even lead to a new PR. These tips are for runners who have already run a 5k and are ‘race ready’. If you are a beginner looking to run your first 5k, then your focus should be on building endurance and completion BEFORE you take on speed. Some of these tips can be applied to your situation (e.g. strength training, etc) but more advanced workouts like track workouts should be skipped early on until your body adapts to handle the increased workload. One of the best ways to maximize your level of fitness is to add volume. For shorter distance races, your longest run of the week should be above and beyond the distance we want to race at. This works great for shorter distance races like 5k’s and 10k’s, maybe even half marathons, but starts to negatively impact us when we race at longer distances like marathons due to wear and tear on the body. For an experienced runner wanting to improve your 5k time, getting to a point where your long runs are around 8-10 miles will do wonders for maximizing your overall cardio fitness level as well as building confidence on race day. Adding 5-7 strides to the end of one of your steady state, shorter distance runs will help with neuro-muscular speed and leg turnover. So if you have a shorter 3 or 4 mile run, add a handful of strides to the end of the run. Use as a warm up prior to a race, or as a finishing touch to the end of a week day, easy run. #3 Have a training focus for a particular race. Instead of showing up for a 5k race on any given Saturday, pick a goal race a few months out mark it as ‘the one‘ you are going to go after. You can always do other races for fun, but having one explicitly dedicated as your 5k PR goal race, will help prepare you mentally. Usually mid-week, I like adding a track/speed workout that starts with 400 meter intervals early in the training season and then working up to 800 or even 1600 meter intervals later in the training season. I also alternate in a few Tempo runs every few of weeks to work on strength and stamina in a sustained run of 45-60 minutes. You can play around with the distance and how often you do Tempo runs vs. track workouts but you want to incorporate these types of high intensity runs into your training schedule. Typically one per week. Add strength training exercises as you can fit them in during the week. Do variations of single leg balance drills, hops, jumps, as well as core body exercises. You can do 5-15 minutes or so each morning when you get up, or in the afternoon when you come home from work, or before bed, or while watching TV. They don’t need to be scheduled, just work to fit them in your schedule. If you are overweight, getting leaner and lighter, can help reduce the amount of energy you need and generally help you run faster. This is an over simplification, but losing excess fat can help in many cases. A taper is simply a period of time before a race that you cut your training volume and intensity back so you can rest/heal up before a race. A 5k taper is much shorter than a half or full marathon taper, but it still is an important phase of your training. That last week or few days before your 5k should be much easier. Do easy, shake out runs, a few strides, and leave it at that. Taper length and effectiveness is highly individualized so you may need to experiment with your taper length, but most people seem to do well with a 4 to 5 day taper for a 5k. #8 Once a month, do a timed one mile or two mile run. This accomplishes two things. One it forces you to run hard and get a little uncomfortable, but it also provides an easy metric you can track over time because as your pace gets faster, your mile or two mile time reduces. The longer the distance, the more other things come into play that can impact your time making it hard to do a apples to apples comparison, but doing a 1 or 2 mile test run can simulate a “racing the clock” situation and be great practice. You race, like you train and if you are inconsistent during training, you will leave a lot behind before you even get to the starting line. You don’t have to be perfect, you just have to show up and do the work on a regular basis. Get to your race early enough to do a 10-15 warmup. If you are going into a 5k race to do well, you don’t want to waste the first mile or two getting warmed up. Get away from others a bit and do some easy warm up strides, maybe a short, easy run, and use the time to get yourself pumped up and into a positive mental state.